Commissioner Rob Manfred discussed the state of the game before the Midsummer Classic. – Manfred said that he likes baseball’s playoff format, including the one-game play-in for wild-card teams. He says the selectivity of baseball’s postseason is one thing that sets the game apart from other sports. One instance in which fans may get their best-of-three wild-card series is if MLB goes to a shorter schedule someday – perhaps after 2016 collective bargaining. It would be one way to offset revenue losses from the regular season. On league expansion, Manfred says he thinks MLB is a growth business. He says he’s open to the possibility of expansion at some point. When asked about Montreal, where the Expos once played, Manfred said he believes the Canadian city has a rich history and showed major interest during two exhibitions. But he says it’s a long way from two exhibitions to 81 home games in a facility that meets major league standards. – Manfred says there is no meeting set yet with Pete Rose, who remains a celebrated presence in Cincinnati. Rose is being allowed on the field for pregame ceremonies before the All-Star Game on Tuesday night. Before meeting with Rose, the first-year commissioner wants to get a grasp of all the evidence presented from when the hits king was banned from baseball in 1989 and additional material gathered since then. Players’ association head Tony Clark later says the commissioner will make the decision about whether Rose should be re-instated but he feels it’s ”a travesty” that whenever Rose is brought up in baseball conversation, it’s tied to his banishment. Clark would not give his opinion on whether Rose should be re-instated. 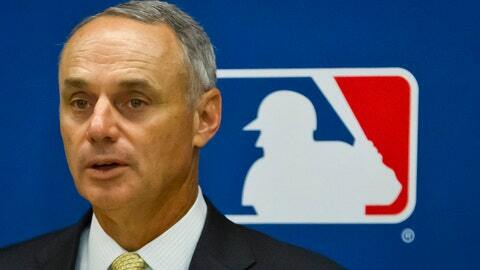 – Manfred says he’s encouraged by pace of play changes and reports that games are moving along better. He told reporters that it’s hard to ignore that the average game time is down 9 minutes, even though average length of game was not the priority in speeding things up. Manfred says the most important issue involving pace of game is player support. He says he’s talked to 29 of 30 teams about pace. MLB has been experimenting with a 20-second pitch clock in Double-A and Triple-A. Manfred says the results are encouraging but bringing the clock to the big leagues would require negotiated changes with the players union. Clark doesn’t sound too interested in using the clock in the bigs. He says the clock’s success in the minors has no bearing on how it would work in the big leagues. The game is fundamentally different at the highest level, he says. – Manfred said no changes to address fan safety are coming soon. The subject has been a hot topic since a woman in Boston was hospitalized after being struck by a flying bat. MLB is still evaluating ballpark safety features and, if there are any changes, they will be implemented before next season. Manfred said he doesn’t "like to be reactive" and making an immediate change would be a "mistake." – Strike three! Asked if umpires are calling a lower strike zone, Manfred deferred to Torre, who is in charge of on-field operations. Conspiracy theorist fans can rest easy, Torre said there’s been no change in strike zone compared to last year. Two years ago umpires began calling lower strikes. Torre insisted there has been no effort to call more strikes overall to speed up pace of play. – Manfred says the commissioner’s office is continuing to work on a new domestic violence policy and will have an announcement shortly. The sides have been talking since last year, following a series of high-profile domestic violence cases involving NFL players. Clark said work still needs to be done to complete an agreement. "We are closer than we have ever been to getting something in place that makes sense," he said. "I couldn’t tell you tomorrow or the day after. I can simply tell you that we’re close."